For Your Cocktail Hour, Get Creative. They had a Chinese “take-out” station, a New York steakhouse station, a pasta station, hand-rolled sushi, and fine wines paired with a great selection of cheeses. Have a Special After-Party. For their after party, the tented ceremony space was converted into an intimate area with white lounge furniture, high top tables, a DJ, extreme dance lighting, a cigar roller, a photo booth, and a candy bar! Celebrate The Holiday. “Fifteen minutes before we rang in the New Year, we lowered our two 12-foot screens from the ceiling and broadcast the ball drop from Times Square." Selecting the wedding vendors was easy. 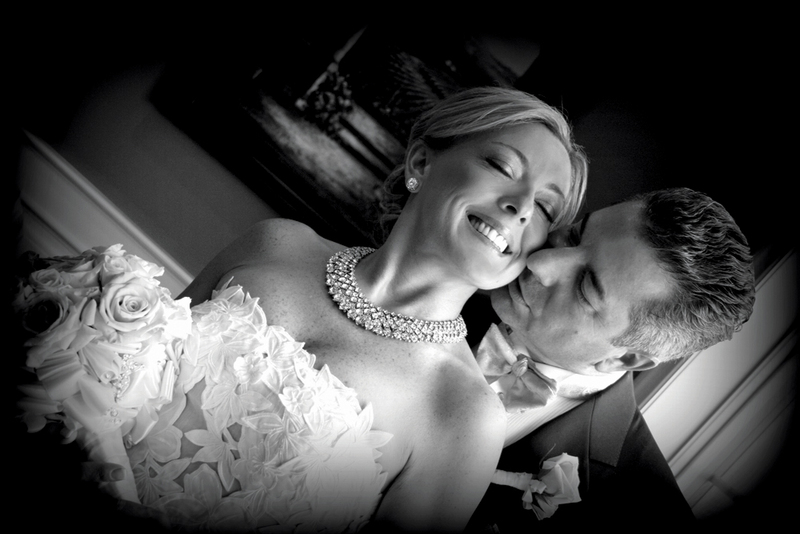 “We used the same in-house vendors we recommend to our brides, including Sal Travis’ exclusive house band and DJ, Reel Moments Video, Petals Premier, and Stark Studio NJ.” They arranged complimentary hotel rooms at the Woodcliff Lake Hilton for anyone who wanted to stay the night and also scheduled a New Year’s Day brunch the following morning to give Tom and Annie more time to celebrate with friends and family. “Tom and Annie wanted a unique ceremony space, so we installed a five thousand square foot tent near our cocktail room. 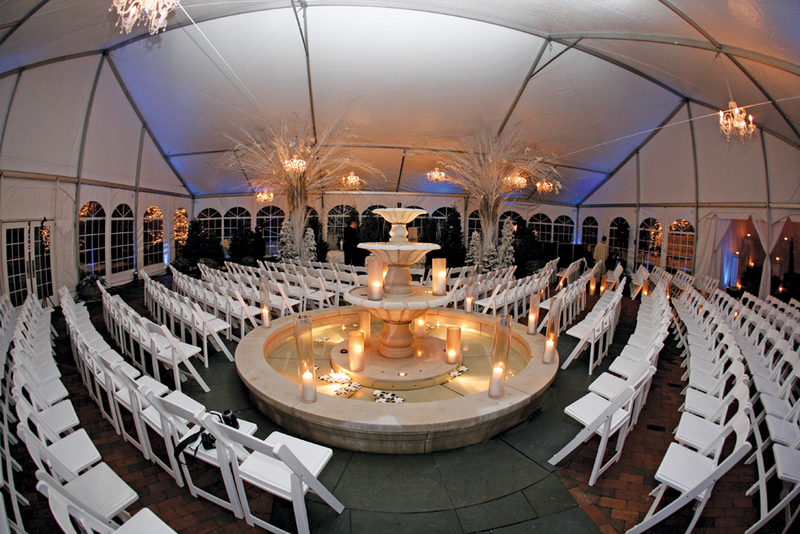 To create a magical winter scene, Petals Premier designed a backdrop of lit trees, hanging crystal chandeliers, soft blue up-lighting to wash the sides of the tent, and lots of candles. 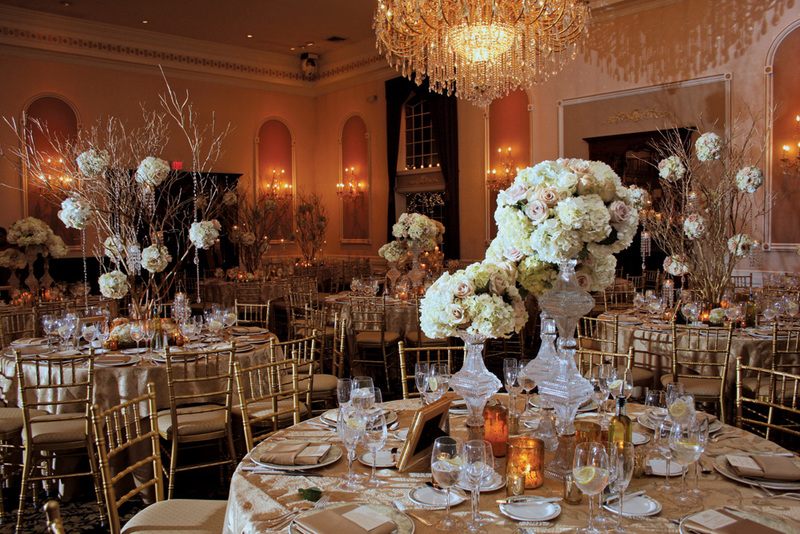 “Annie loved the idea of alternating centerpieces in the Grand Ballroom, so half the tables had five-foot tall gold branches suspended with roses, crystals, and candles, while the other tables had three different heights of crystal and gold pedestals that held blush and cream colored roses.” At the base of every centerpiece were beautiful gold candle holders and votive and pillar candles. 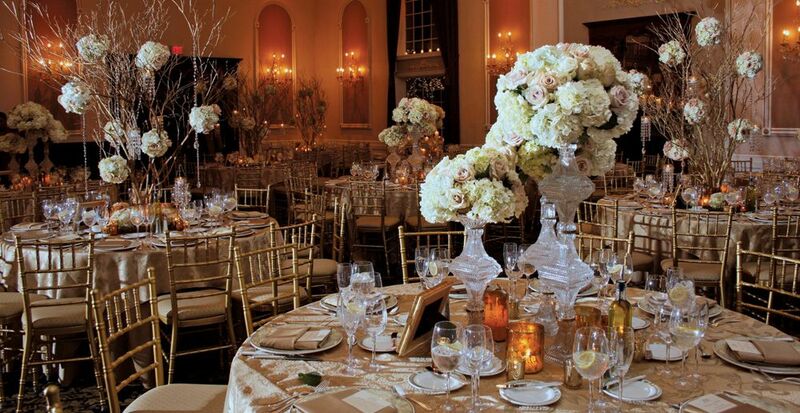 Candles were also placed on the 15 windowsills throughout the ballroom, and they also used their in-house LED lighting to accent the room with a warm gold tone. 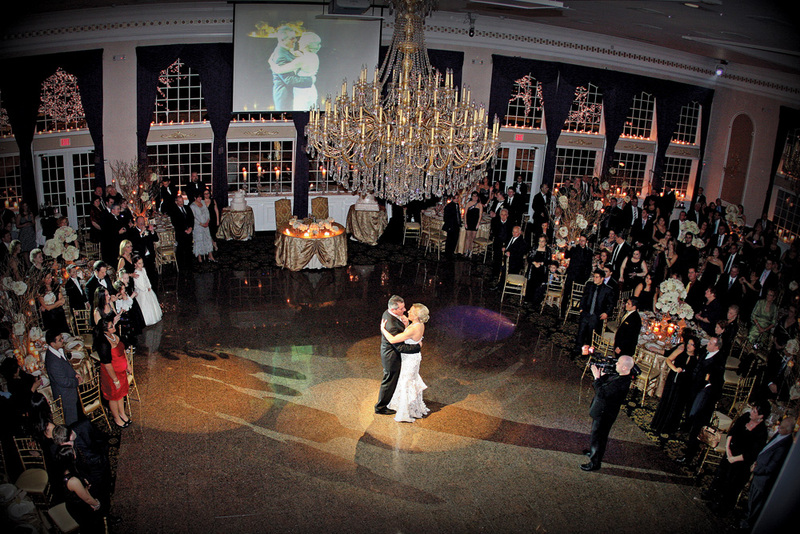 For the after party, the tented ceremony space was converted into an intimate area with white lounge furniture, high top tables, a DJ, extreme dance lighting, a cigar roller, a photo booth, and a candy bar. 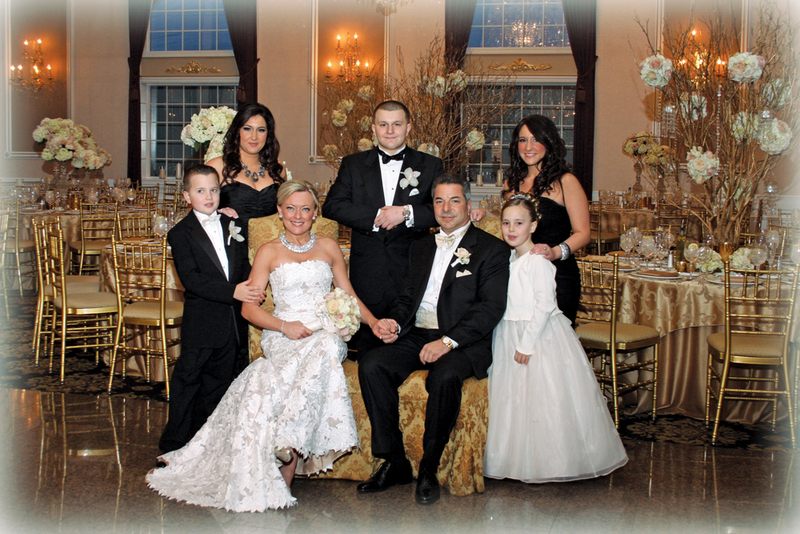 Technology has been a big part of the Florentine Gardens since they added their new Grand Ballroom in 2002, “and New Year’s Eve is a great night to showcase everything. 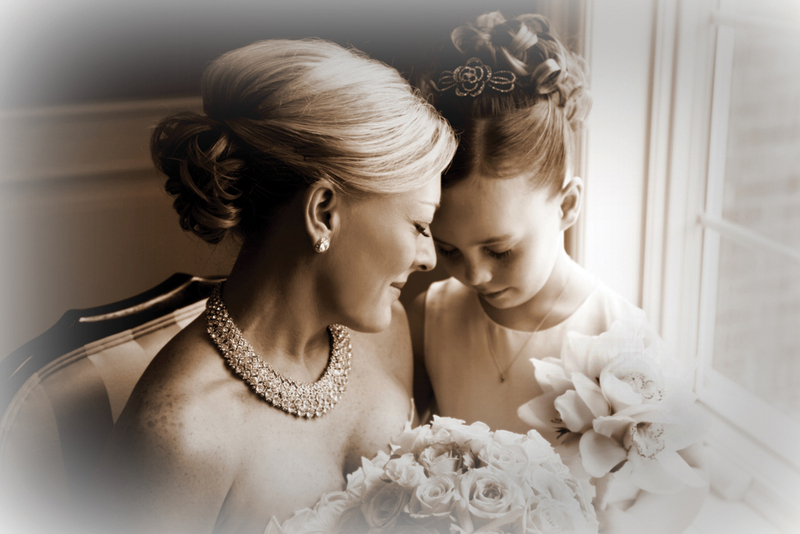 We had a live feed throughout the wedding, so families and friends who could not attend could enjoy the festivities." Just before midnight, they served champagne and displayed a table overflowing with horns, noise makers, sequined black top hats, and handmade hairpieces with large feathers and rhinestones. “The moment the ball dropped, our house band played Auld Lang Syne as cannons blasted confetti throughout the room from our Juliet balcony!